The profile width is 1 1/2", and the rabbet depth is ½”, so matted pictures make the most sense in terms of depth considerations. Fine art paintings on rigid hardboard panels or canvas boards are also ideal for this frame, as are fabrics stretched on foamcore or other thin material. It is also best to consider the decorative themes in your space, to determine if this frame will work with the feel of the room. Red is typically viewed as a bold color, but this red is soft and subdued because of the mauve tonality and also the washed, distressed finish and worn edges. 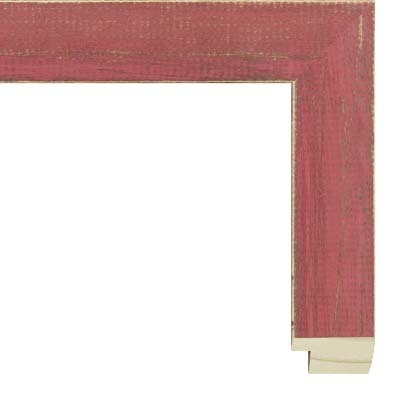 Children's art and illustrations of sailboats or teddy bears might also pair nicely with this mauve red picture frame. Possible matting combinations in our acid-free archival selection include Bandage 9571 and Rose Bush 9871, or Half & Half 9509 and Mystic Blue 9828.